Leading mid-Wales Limousin breeder Michael Gray made a shrewd decision when he bought back a heifer he’d originally sold. She was full sister to the 2004 Royal Welsh Show’s female champion Fleethill Sal who later sold for 17,000gns. She came home suckling an impressive bull calf who finally came on to the market last weekend to top the British Limousin Cattle Society’s show and sale at Brecon at 4700gns on Saturday 11th November 2006. Auctioneers McCartneys achieved a £2100 average for 22 bulls on a day that brought a big crowd to Brecon market for a selection of sires from many of the region’s leading breeders. 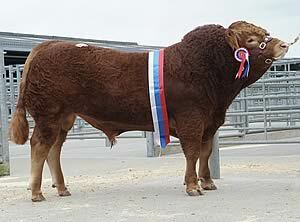 Michael Gray’s sale topper, the May 2005-born Caergynant Alex, weighed 775kg on the day and collected the championship under judge R Jones, Montgomery, Powys. His dam, the Shire Pentagon sired Fleethill Trish, was sold as a heifer and then bought back by the Fleethill herd suckling Alex as a bull calf. “Trish is full sister to Fleethill Sal who was the 2004 Royal Welsh Show’s female champion and who then went on to sell for 17,000gns,” said Michael Gray who runs 80 pedigree cows in his long established Fleethill herd at Llandrindod Wells. Alex, who is by the Greensons Olympian son Maernelodge Sierra, stayed locally with A Thomas, Knighton, Powys who will use him on pedigree and commercial cows. Peter Kirton of A G Kirton and Son, who run 80 pedigree cows at Bewdley, Worcestershire, were once again among the top prices at this fixture with progeny of the 68000gns sire Goldies Osprey. This time it was with Ashledge Argonaut who made 3700gns. “Osprey has done a great job for us. He’s got some top French breeding through his sire Lascard and really stamps his calves,” said Peter Kirton. Argonaut, bred out of a Greenwell sire, goes to P Jones and Co, Brecon. Taking the reserve championship was Ludlow breeder A W Smith with Bringewood Atomic. By the good producer Kype Orkney and bred out of a cow by the popular sire Djerk, he made 3600gns to Jones Bros, Lampeter. Leading breeder Aled Edwards from Llandovery achieved a best of 2500gns with the high performance ranking sire Dyfri Valiant. By Pantin, and from a cow going back to the consistent female producer Rake Terence, he has a high Beef Value of 31. Buyers were E and E Thomas, Llandeilo. Also at 2500gns was the first prize winning Deri Vogue, a bull by a Greenwell-bred sire. Successfully shown last year by owners Mr and Mrs T Griffiths, Llangain, Carmarthen, he goes back to his home county with A Davies, Ffymnondrain. Jones Bros from Lampeter took a second bull paying 2400gns for Bailea Vinnie Jones from Brian Jones’ well known herd at Heolsenni, Brecon. He has a Beef Value of 27 and is by the French imported sire Ocelot. 22 bulls £2100; five cows and calves £1167 and four unserved heifers £1021.